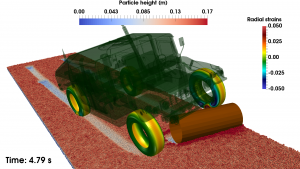 Current modeling and simulation capabilities permit tackling complex multi-physics problems, such as those encountered in ground vehicle mobility studies, using high-fidelity physics-based models for all involved subsystems, including the vehicle, tires, and deformable terrain. However, these come at significant computational burden. To alleviate the prohibitive computational costs of a coupled simulation of the overall problem (resulting in a multi-physics, multi-scale dynamical system with millions of degrees of freedom), we develop a HPC co-simulation framework which enables a decoupled simulation. The Chrono::Cosimulation framework is developed over a distributed MPI-based layer. Taking advantage of the hardware configuration of current supercomputer clusters, the adopted methodology leverages parallelism at multiple levels, from multiple node distributed MPI, to multicore shared-memory within a node, and SIMD instruction-level parallelism within a thread. Simulation of flexible tires is performed with a multi-core, OpenMP-based, approach. Granular dynamics, including both the collision detection phase and the numerical solution of the discretized equations of motion, can be performed in parallel either on the GPU, or in a multi-core shared-memory OpenMP fashion, or else in a distributed MPI framework.